February 2009 marked the 10th Anniversary of the publication of the Inquiry into the events surrounding the investigation of the murder of Stephen Lawrence. This book marks this anniversary and examines various dimensions of the impact of Lawrence on policing policy and practice. It identifies a series of dimensions and processes associated with British policing in terms of the role that the Lawrence agenda has had on forming and/or shaping policy and practice in that particular area, and in doing so assesses the extent to which the original recommendations and issues raised within the Lawrence Inquiry have been reflected in policy, practice and, importantly policing outcomes in service delivery. The book integrates practitioner and academic reflection on the impact of Lawrence and includes contributions from some of the key policing figures who were involved in post-Lawrence implementation and development programmes. As such the book will be of interest to both an academic police studies/criminology audience and police-practitioner audiences. 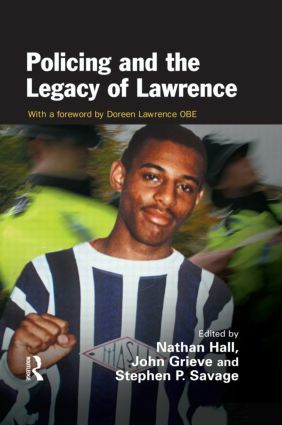 The Stephen Lawrence Inquiry: from intelligence failure to intelligence legacy?